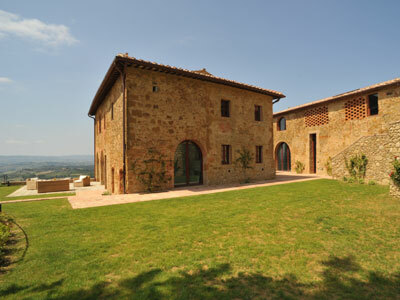 Villa Torre Il Santo is located on top of one of the most beautiful hills of Chianti. The Villa overlooks stunning valleys and offers our guests breathtaking scenes of the countryside surrounding it. Villa Il Santo was originally built in the year 1000, and today, after a long period of restoration, it is a unique location with all the extra comforts needed for an unforgettable holiday. The Villa is composed by two parts which are connected. The Old Tower section is completely restored with old brick flooring and an old wood ceiling and has all the very best of modern facilities. The Hay Barn section has been restored with a modern, contemporary look. A nice garden, with lawns adorned with roses, jasmines and local plants and flowers, offers to our guests different areas to relax in privacy. There is also an infinity swimming pool with an annex Jacuzzi overlooking the amazing Chianti Valley, with its vineyards changing colors in different seasons and the beautiful San Gimignano's skyline in the distance, guarantee complete relaxation under the Tuscan sun. The villa is located on the top of a hill over looking Chianti valleys with breath taking views on hills and on San Gimignano sky line. Located at about half hour drive from Florence, Siena and San Gimignano. Restaurants: Il Paese dei Campanelli (200 metres), La Fattoria, Il Macereto, La Locanda di Pietracupa, La Gramola, Il Mezzo Marinaio. Supermarkets, shops. Horseback riding, wine and cheese tasting, ceramic courses, airfly ballon, high fashion outlets. Barberino Val d'Elsa 3 km.